- Publisher It's official! The popularity of this delightful series increases with each season! Author Martha Bolton, popular humorist and longtime staff writer for Bob Hope, shares her wit and warmth in these charming books--available in both softcover and a special hardcover gift edition. Whimsical art, carefully chosen quotes, lighthearted messages, humorous lists, and gift coupons for the grateful recipient make these fun books a joy to give and receive. - Publisher With wit and wisdom, Bolton delivers a lighthearted look at the who, what, when, where, why and how of hugging. Illustrations. 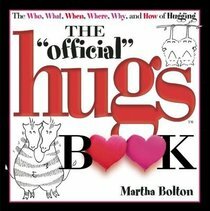 About "The Official Hugs Book"
It's official! The popularity of this delightful series increases with each season! Author Martha Bolton, popular humorist and longtime staff writer for Bob Hope, shares her wit and warmth in these charming books--available in both softcover and a special hardcover gift edition. Whimsical art, carefully chosen quotes, lighthearted messages, humorous lists, and gift coupons for the grateful recipient make these fun books a joy to give and receive. With wit and wisdom, Bolton delivers a lighthearted look at the who, what, when, where, why and how of hugging. Illustrations.